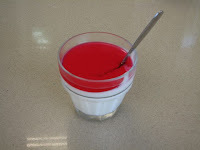 Malabi is a popular dessert in Israel which is made of milk and cream, jellified with cornstarch, and then sweetened on top with rose syrup, and some add nuts and coconut. Maybe the best malabi you'll eat is in Malabi Dajani pit, which is running for three generations now and keeps attracting dozens of fans which are all addicted to his secret and magical recipe. As Tel Avivians do, you can have the malabi for the finale of your hummus excursion at Abu-Hassan. Take bus 25 and go down at Jerusalem Blvd. 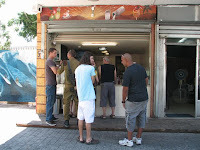 ("Shderot Yerushalayim") 96 - on the corner of Erlich st. If you're coming from Abu-Hassan, go back to the boulevard, and then go the same direction of the bus you got there with until you get there.